Posted by dutchgrub	on Wednesday, February 17, 2010 at 18:16. 7 Comments. Fresh white truffles still are a rare find in Amsterdam, both in shops and restaurants. About a year ago I found some at Feduzzi and loved their intense smell and aroma. I just got word from De Witte Uyl, one of dutchgrub’s best Amsterdam restaurants, that they have three specials with fresh white truffles on their menu. So I thought I’d pass it on to you to encourage you to head over to De Pijp for some grilled scallops with white truffle, carpaccio of venison with freshly grated white truffle, or an oven dish of spinach and egg served with freshly grated truffle. All sounds great to me, especially if finished off with De Witte Uyl’s trademark chocolate bord! Filed under amsterdam, best amsterdam restaurants, food, restaurant. Ate their two days ago…the carpaccio of venison was not with white truffles but black truffles although the scallops were with white truffles and a lovely pungent oil. Hi Peter, we are using the Tuber Magnatum, the white truffle, in all three dishes, so not a black truffle. 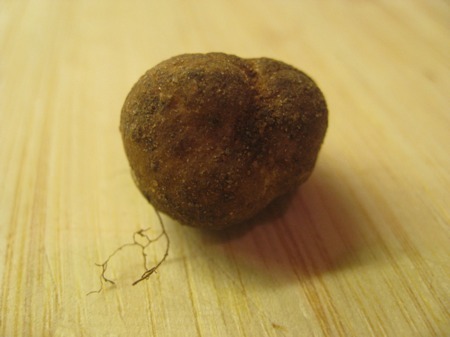 But I am surprised as well that this white truffle is sometimes very white and sometimes pretty dark on the inside. If you google the Tuber Magnatum you’ll find the darkness described as dark red. When we were using the winter truffle ‘Tuber Melanosporum’ 1,5 weeks ago some of them were pretty light on the inside and some very dark. The outside of both truffles is completely different though. The white truffle is kind of beige and pretty smooth while the black one is black and lumpy. Also the taste and smell are different. The white one smells of gas and has a delicate taste that stays with you for a long time and the black one has a more earthy smell and taste that doesn’t stay so long. It is the first time we are working with truffle and I find it very interesting and am learning a lot. But I can assure you that in both your dishes last Saturday we used the Tuber Magnatum, the white truffle. How cool to have you here on Dutchgrub! And thank you so much for answering Peter’s comment in such detail! I will definitely introduce myself on my next visit. Hopefully soon! Will be great to chat about food and wine and our favorite spots in Amsterdam and the rest of the world! Thanks so much for pointing us in the direction of De Witte Uyl. We went there last week for the first time and were blown away by it. Not least by how enthusiastic the staff were and how ‘gezellig’ it felt. We have already made another reservation. As a Melbournian (perhaps the most food obsessed people on this planet), all good recommendations are gratefully received. On that note, do you have any recommendations for food and / or restaurant related blogs in Dutch? Having come out the end of the inburgering process ;-),it would be nice to try out some Dutch sites. Thanks for putting in all the effort on your site. You must be helping lots of Amsterdam strays find their way. thank you for the kind words! Sounds like I should be planning a trip to Melbourne to mingle with the most food obsessed people on this planet. For Dutch food blogs you might want to check out http://klarykoopmans.blogspot.com for mostly recipes and http://eetschrijven.blogspot.com for lots of interesting thoughts on the Dutch food world. Hope the “inburgering” goes well!